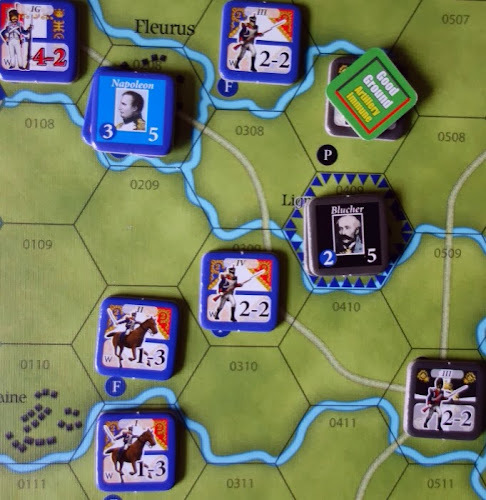 This post covers an After Action Report for the Waterloo scenario in GMT's 'Fading Glory' game, this game has been published in partnership with Victory Point Games - the original publishers. This is my second AAR from the quad. See the Borodino 20 write up under the GMT label (pre WWII) to the right for notes on that game. Click continue for the rest of the Waterloo post. I am writing this report as I play the game, so the story is given in the present tense, with the future unknown. 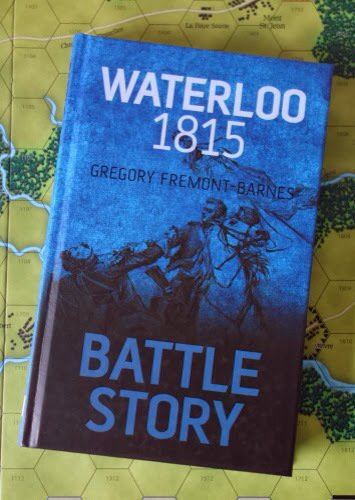 Alongside the game I am reading 'Waterloo 1815' by Gregory Fredmont-Barnes, from the Battle Story series, published by The History Press. This game report will include quotes from the book. I am playing the full three day campaign (there is a smaller final day scenario - Waterloo itself) which starts with the Prussians in and around Ligny, the Anglo-Allies at Grand Champ (just south of Quatre Bras) and the French having just entered the map. 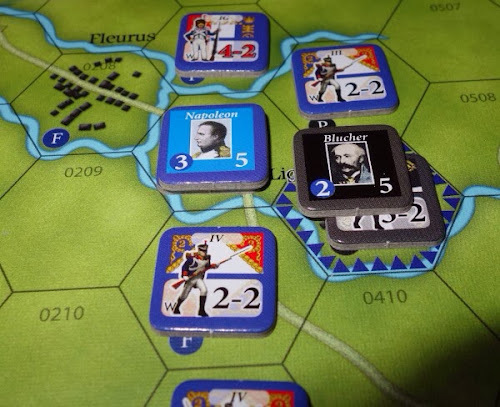 The French need to be careful in the opening turn, because if any of their forces rout, there is a chance they will leave the map edge and be removed as 'breaking' units. All the optional rules are in play, including variable weather. Version 3 of the series rules are in use. EDIT - please note a critical mistake, pointed out to me by the designer. 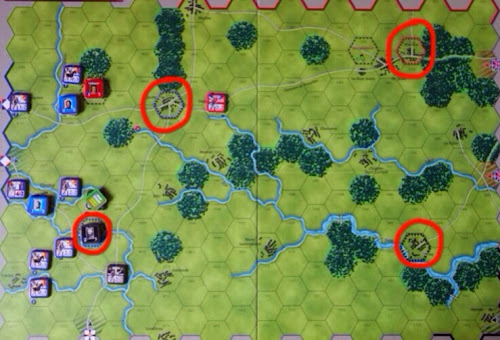 Wellington and I Corps do NOT start in Grand Champ, but rather two hexes back, next to Quatre Bras, where the small red dot is (below). That would make for a very different opening - sorry all. 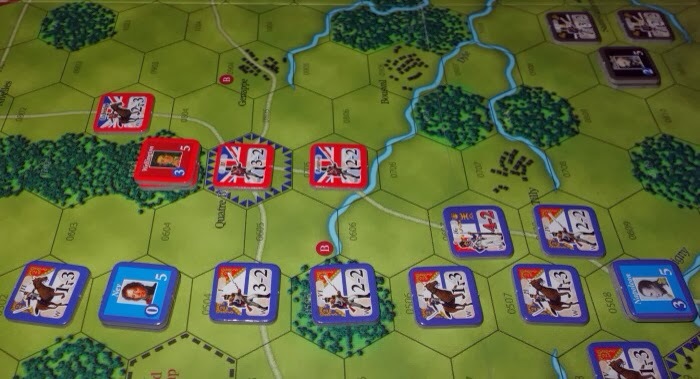 The four main geographical objectives in the game are Ligny (bottom left), Quatre Bras (top left), Wavre (bottom right) and Waterloo (top right), occupation of which are linked to the overall objective of driving the opponents morale level down to zero, at which point the game is won. The Prussians are on the lower half of the board and the Anglo-Allies the top half. The game starts in the afternoon of the 16th June, with the French already starting to engage both allied armies. The major river at Wavre (Dyle) can only be crossed by bridge. It is always interesting to see how Waterloo designs in general handle the D'erlon situation on the 16th. Here, there are no special 'straight-jacket' rules for his Corps. 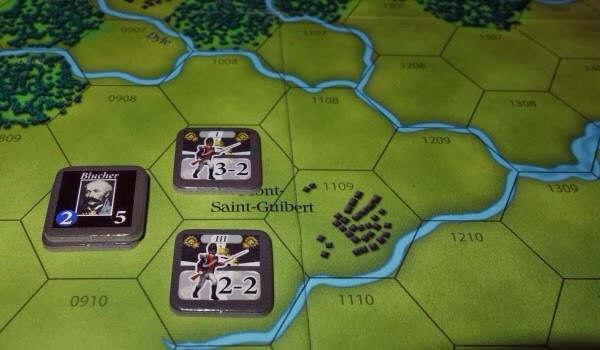 There is however a random event card that when drawn by the French player allows the allied player to place a routed marker on any non-adjacent French unit. The card is called 'Conflicting Orders' and it seems to be dealing with this kind of command breakdown, I like that approach. At the start of a players turn, they draw a random event card. The game is not card driven and if anything, they actually enhance solitaire play. Turn 1 - Afternoon, June 16th 1815. The weather is cloudy. The French side are player 1. Wellington is with I Corps at Grand Champ, which is a fortified location and they receive the first attack. Both sides pay a morale point to assist their combat strengths (this represents releasing immediate reserves). The result is a Defender Withdraw 1 hex (DW), but the fortification cancels that and it becomes a 'no effect' result. This leaves the French locked into the Allied ZOC, they can only disengage at night. In contrast, Wellington is not locked into the French ZOCs, because the French ZOCs do not extend into fortified hexes, so Wellington from this position could disengage if he chooses and also does not have to get involved in mandatory attacks. At Ligny, all the available French units except the Imperial Guard engage the Prussians. The artillery reserve is close by, but is too late to join in with the opening of the attack. The initial attack at Ligny is tough on the French because of the defensive terrain layout and modifiers. They feel lucky not to suffer worse than a 'no effect' on the left and a French withdrawal in the centre. On the right however, their cavalry manage to push Prussian III Corps back, this could open some potential advantages in the next turn. Napoleon could do with an extra corps on turn 1 to hit the Prussian right flank. The book: What Ney needed most was the additional 20,000 men of d'Erlon's absent formation. To Ney's aggravation, Napoleon had overridden his plea for assistance, the Emperor instead insisting that I Corps operate against the Prussian right flank at Ligny. The green counter in the photo above is used to show the effect of the ground conditions in that hex and how it might effect artillery fire. It is generated by card play. In the Allied part of the turn - The Anglo-Allied Reserve moves up, passing through Quatre Bras, but it chooses not to engage the French flank, so that like Wellington, it will not have to attack. These units are just content to block the French for now. At Ligny, the Prussians can't really manoeuvre due to enemy ZOCs, so they must make their mandatory attack and hope for the best. Their 1st Corps, the one under that green marker in the previous photograph, assaults, fails and routs away (this causes a morale drop), allowing the French III corps to advance across the river and take up position just above Ligny (victorious defenders can advance after combat) as the above photograph shows. However, over on their left flank, the Prussians manage to rout the French II cavalry Corps, which halts its retreat at the map edge - lucky! Turn 2 - Dusk (day 1 is a shorter day, as the scenario starts in the afternoon and so only has 4 turns compared to 6 turns for the following days). The weather worsens to 'downpours' (looks like it has come a day early!). This has several negative effects on combat and movement but most notable for those in and around Ligny, the rain swells the rivers to make them in effect major rivers, which can only be crossed at bridges and ZOCs do not extend across them. The book: Napoleons late orders, combined with foul weather in the form of a torrential downpour, left his plans in tatters. Things immediately go badly for the French. Blucher's II Corps in Ligny causes III Corps to fall back, but now it can't go back across the swollen river. It's only escape is via a Prussian ZOC, which is located just off the top right of the above photograph. They must take a 'hazardous retreat' test for passing through an enemy ZOC, with a 50 / 50 chance of failure. They test, fail and break and are taken off the board (they may rally later). This causes the Allied morale to increase by one level (to 6) and the French morale to drop by one level (to 4) - not good. As evening arrives, both allied armies seem to be holding their ground nicely. The French VI corps arrives onto the board. The downpour means that the French let it arrive between the swollen rivers, so that it can advance out into an open area roughly on a line between the two allied armies. The rivers continue to impede the French, who cannot bring adequate force against the Prussians. The Imperial Guard moves further along the river bank in an effort to come around the head of it (rain has brought their movement down to just 1 MP). Over at Grand Champ, Wellington survives another DW (defender withdraw) result, which is converted by the fortification to a 'no effect' result. 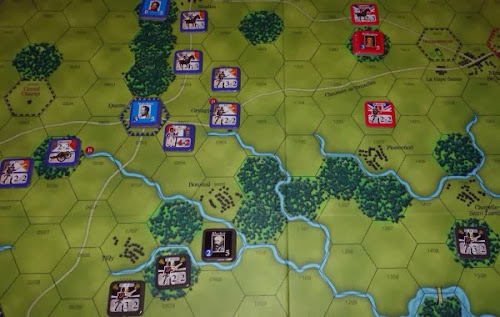 Above - At Ligny, attacks cannot be made across the swollen rivers, except at bridges, so the only combat comes from IV infantry Corps and I cav Corps against the Prussian III Corps. The Prussians are now up against a major river, so cannot retreat that way. Realising the seriousness of their predicament, they use a morale point to increase their strength, but to no avail. They suffer a rout result and roll a 5 for retreat distance. They go via the empty hex in 0509 (their only avenue of escape) and fortunately pass their hazardous retreat test, continuing their 5 hex rout over the bridge and towards their own LOC. 1st Cavalry make an uncontrolled pursuit into 0509. Blucher decides to pull II Corps out of Ligny as the French positions of both the Imperial Guard and 1st cavalry are now threatening - especially if the rain stops suddenly - which it might! Night - At night units can disengage (they can't in the day), only move 1 hex and cannot enter an enemy ZOC. The weather deteriorates further to 'storms' causing mud. Outside Grand Champ, French III cavalry Corps disengage, Wellington predicts that this is a prelude to a flanking move and so he abandons Grand Champ with 1st Corps, satisfied that he has held the French up for a day. While withdrawing, he hears news that the Uxbridge cavalry Corps are on the way to Quatre Bras from Neville (i.e. they are already on the board). The book: (re Ligny) By nightfall, largely thanks to coordinated efforts by artillery and cavalry against the Prussian centre, the French at last drove their opponents from the field. In wargame terms, this has been a very exciting part of the game and one of the most satisfying wargame sessions that I have played in a while due to a variety of subtle nuances that the system brings about. French morale stands at 5, the Allies at 6. 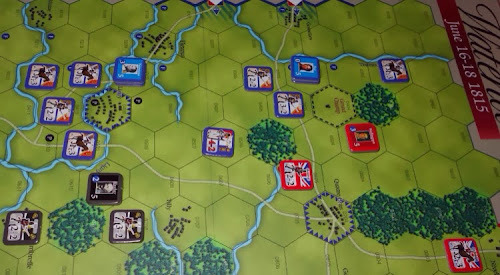 Both Allied armies are now starting to fall back, but around Ligny, the French are still lashed up by swollen rivers and will take a while to re-organise and pursue. 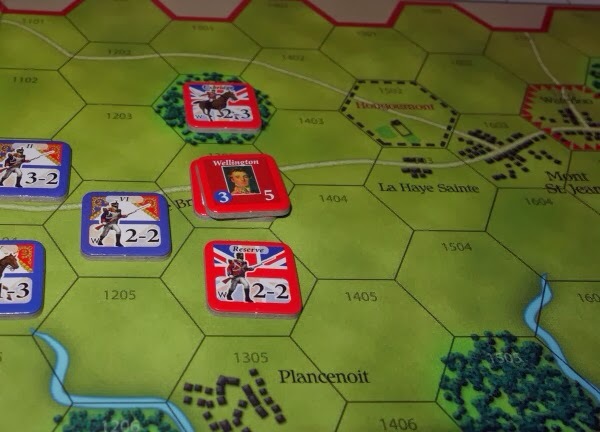 The French III Corps (removed from play earlier) attempt a rally roll, but significantly fail and are out of the game for good - ouch! June 17th - Morning. Weather, the downpour continues. Above - Morning, the view from behind the allies lines. Ligny (empty) is on the left, the French can only cross the rivers at the roads due to the rainfall. The allies are looking to disengage, to get a better defensive position and build up their morale levels (through non-engagement). At Ligny, the French I cav Corps cross the bridge (along the road) and attempt to keep contact with the Prussians, but they are forced to rout away. The Anglo-Allied army moves to concentrate around Quatre Bras and the nearby woods. II Corps are just a couple of hours away (longer if the rain doesn't stop). Uxbridge is on the road, bottom right of the above photo. Mid-day. Above - the rain reduces to 'showers'. 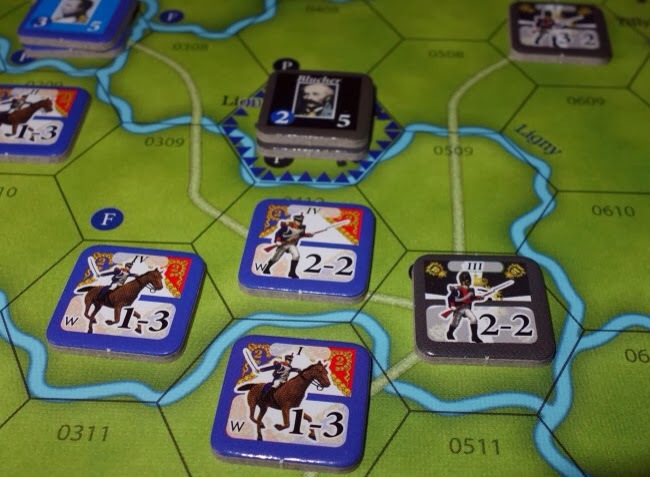 Blucher takes a risk and moves to cross the lower part of the River Dyle. If downpours return, he would get trapped here because the minor rivers would become swollen (to count as major rivers). Prussian IV Corps has arrived on the board in the rear and is making for Wavre bridge (a French objective much further to the right of the above photograph). The book: But owing to vaguely worded orders the Prussian IV Corps, under Bulow, failed to join the main body and thus played no part at Ligny. Above - The Anglo-Allies prepare a defensive line based around Quatre Bras and the Prussians have successfully disengaged (see the three black units in the top right of the photograph). However, it now becomes obvious that the bulk of Napoleons force is well positioned to strike at the Anglo-Allies in force and that the Prussians are at least a turn away from being able to come to the rescue, so staying around Quatre Bras for Wellington could be somewhat perilous. 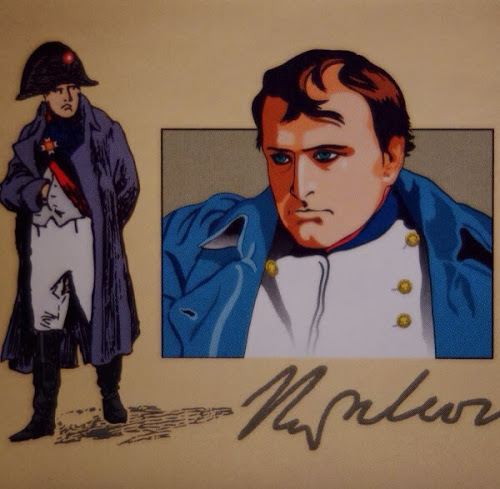 The book: Napoleon, for his part, belatedly issued orders late on the morning of the 17th both to fix Wellington in place and to dispatch a corps of 30,000 men and ninety-six guns under Grouchy to stay in contact with the Prussians and prevent them from supporting Wellington. Afternoon - The French are positioned to launch a big assault on the Anglo-Allied line at Quatre Bras, but they draw the 'Napoleon's illness' card that says they must roll twice in every battle and use the lowest score. Above - The French decide to make a partial attack. IV Corps and IV cav Corps will move on Tilly, to cover their right flank from potential Prussian advances. III cav Corps will move into the top of the woods to try and work around the Anglo-Allied right flank. The VI Corps and I cav Corps will hit the Anglo-Allied reserve just below Quatre Bras. They do that and get a 'no effect' result, although it does leave the Allies adjacent, who must then themselves attack (mandatory and can't leave ZOCs during daylight) in their part of the turn. That counter-attack causes the Reserve to rout away two hexes (so no morale loss for exceeding their movement allowance) and the French I cav Corps follow up, halting immediately below Quatre Map (as the above photograph shows). 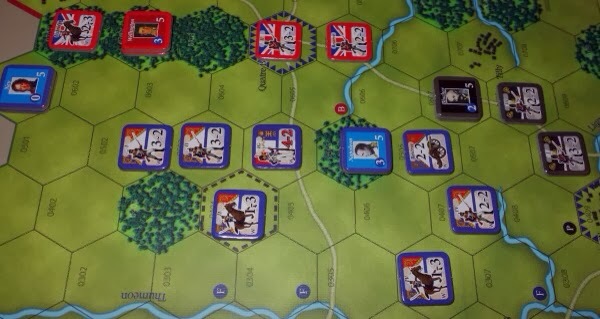 The allies respond assertively, Wellington takes his I Corps through the woods and attacks the French III cav Corps, which is also pinned by Uxbridge cav Corps. The Reserve rallies from rout and moves back into the line and II Corps take up position in Quatre Bras. The Prussians back-track and manage to contact the French right flank. The French are pushed back on both flanks, but in the centre, the Anglo-Allied Reserve attack goes badly and they rout (again!) all the way back to Genappe. This has given the French an unexpected opening between the two allied armies. Dusk - The downpour returns. This is a mixed blessing for the French, but it does at least make the Dyle river now impassable to the Prussians, partly protecting the French right flank in the process. The French take Quatre Bras, but II Corps counter-attack and take it right back. The Prussians move to the end of the Dyle River and attack the French flank, pushing it back. Evening - Downpour (still). The French attack Quatre Bras from three sides, but the rain reduces infantry strengths and they end up withdrawing. 1st cav Corps have to make a 'hazardous retreat' test for going via an enemy ZOC and they fail the test (remove from play as broken). This moves the French morale to 2 and the allies to 5. Prussian I Corps is pushed back by V cav Corps, who adopt a screening role. The book: (at Quatre Bras) While French cavalry briefly stood upon the crossroads, they could not hold them without support from their infantry, which failed to materialise. This is a serious situation for the French. The day is almost over and they are strung out against both allied armies. Night - The 'Change in the weather' card is drawn, which means that the weather will 'tend' to improve, but at present, the dreadful downpour remains. There are some morale adjustments made at night and occupation of objectives can effect this. The Allies still hold Quatre Bras, a French objective, so the French lose a morale point. They are now at 2 morale points compared to the allied 6. The next turn will be critical to the survival of the French. June 18th (historically, the Battle of Waterloo occurs today), morning, the weather improves to showers. The French take Quatre Bras after routing the defenders. Wellington and I Corps immediately re-capture it, but they are now alone. Mid-day. The French draw the 'Napoleon's illness' card (again), requiring them to to attack with two dice and use the lower roll. The weather improves to cloudy. They surround Quatre Bras on 4 hexsides and commit the Imperial Guard, which costs an extra morale point. They are now down to just 1 morale point, so if they lose another point, the game ends instantly and they will lose. Note, if the Guard do not 'win' in a battle, a morale point is lost, so their involment here shows the 'do or die' nature of the situation. It is an overwhelming attack, made on the +4 column. Two dice are rolled. The higher score (was a 5 and would have broken the defender) cannot be used. The lower score (3) gives a defender rout result, but the defenders roll a '1' for retreat distance and then deducts 2 for being elite. As this makes the retreat distance score drops below 1, the result is converted to a DW instead (retreat 1 hex). A screaming out aloud moment for the French player. So now they must retreat, but do so via an enemy ZOC, so they must take a 'hazardous retreat' test, which they fail, so the unit breaks after all! The French morale goes up by 1 (to 2) and the allies drops by 1 (to 3), it is getting close. I Corps is removed from the board and Wellington is put on the turn track to return in the next turn. There is now quite a gap between the two allied armies, the game again opens up to possible victory by either side. The Anglo-Allies set up a new line of defence further back, across the Waterloo road and the Prussians once again begin to retire to match the Anglo-Allied withdrawal. Afternoon. The French pursue the Anglo-Allied units but cannot catch them. This disengagement period allows both sides to recover 1 point of morale. Above - French VI Corps manage to catch up with the Anglo-Allied Reserve. The combat results in 'no effect', but at least the allied unit is pinned as you cannot voluntarily move out of an enemy ZOC during the day. The French deploy against the new line of resistance. While they position themselves, the Anglo-Allied Reserve Corps are able to attack and cause a French unit to rout further than its movement allowance, pushing their army morale down level to just 2. The book: Wellington's retreat north left his forces fatigued but still fully capable of engaging the French a second time. Evening - this is the last chance before nightfall for the French to attack and turn things to their favour. 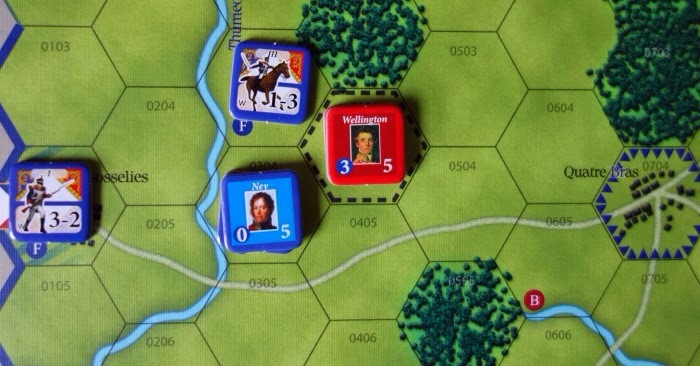 Uxbridge, defending the single woods hex looks to be the most vulnerable target, so his cavalry corps is attacked. He is pushed back but passes a hazardous retreat test. 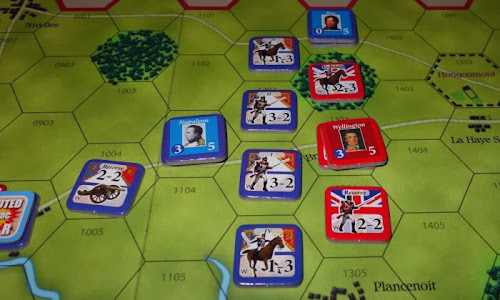 However, the Anglo-Allied Reserve rout (6 hexes) when they are attacked and this lowers their morale by 1 point. Night turn (final turn). The Anglo-Allied forces move into Hougomont and La Haye Sainte. Overnight morale adjustments are made to the morale tracks (for resting), bringing the French level to 3 and the allies to 4 and in the absence of either side having forced the others morale to zero, this result counts as a minor allied victory. This has been the tightest of wins. The book: By permitting Wellington to withdraw from Quatre Bras, the French enabled the duke to establish himself in a pre-arranged position of considerable strength. In the case of the Prussians, although badly mauled, they extricated themselves entirely from Ligny, moving northwards to Warve unmolested. It was a fascinating game and 'a close run thing' as Wellington himself observed. The Anglo-Allied III corps (Frederick) never arrived and all rally attempts (made at night) resulted in eliminations, a change in either of those events could have made a difference to the final result, as would better weather on the 16th, which probably cost the French a days march. In the final turns, the fast movent of the Allied-Anglo force and the terrain in the middle of the map, prevented the Prussians from joining their allies in a united battle against the French forces. The book: Despite a catalogue of errors - mostly on the French side but by no means confined to it - the outcome of Waterloo must not be viewed as a foregone conclusion. I think this is a great gaming package and system. Hats off to all those who been involved in its long journey from a Joe Miranda design, to a Victory Point Games series, to the GMT version that I have. 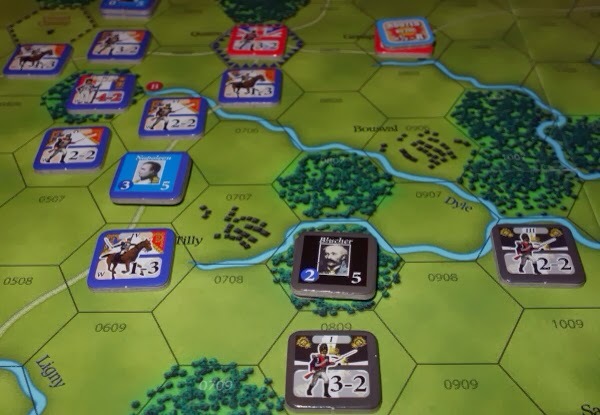 There are many other interesting battles in this series covered and published by Victory Point Games, check out their website.